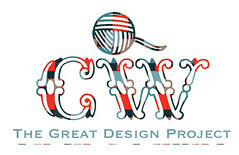 Today I received an email announcing the sneak peak at the new Interweave Knits Holiday Gifts 2012 issue...and this photo to the left is one of three mittens that I designed for this issue. These are the super-secret project I'd hinted to in April. I couldn't be happier with them and I'm honored that they were chosen as one of the featured patterns for the sneak peak email. I've been riding on cloud nine all day. Twitter and Facebook responses have all been quite positive. It was going to be my biggest design day yet (you know, because it's my first print publication...). 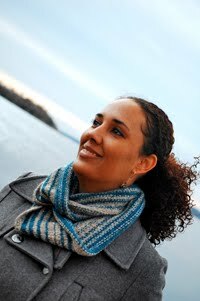 And then I uploaded the pattern and pics on Ravelry. The mitten is right next to this baby's mouth (which is unfortunate, but not my doing). However, if you look closely, you can see that he's eating something that he's holding in his little mitten hand, and that he's sitting on the lap of a supervising adult. He is quite safe. That being said, I would not have placed buttons on the smaller sizes but they were necessary to show the motif. 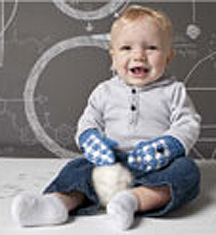 There are actually three different mitten patterns, with two different versions of each pattern, and several of those can be done without buttons. The mittens in the above photo have no buttons. My intention was for the knitter and parent of the child to do what most people do...use their common sense and best judgment when deciding on whether or not to place buttons. I guess what I "needed to do" was to place a clear warning on the pattern. I have to say, I'm disappointed. I really love these little mittens. Interweave loved these mittens. My friends and family love these mittens. I thought that everyone else would love them as well. I've read about other designer's getting nasty-grams from knitters about something they didn't like, but I'd never received one. It feels really personal. But rather than argue about how I'm not the mother-of-the-internet, and that people are smart enough to figure out when it is and is not safe to put buttons on baby things, I decided that instead of fielding more and more of these types of messages, I would state the obvious. So now I need to mentally shake it off, and to help me do that...I've got a book giveaway. 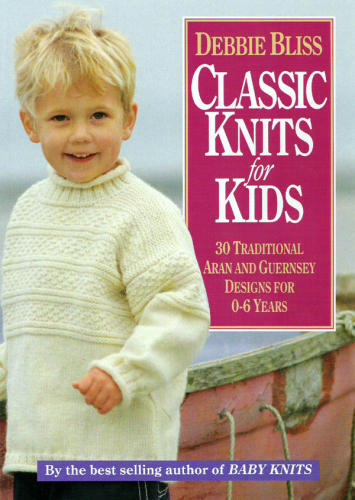 Hold on while I go upstairs and reach into the Box O' Knitting Books. (Jeopardy theme song plays...). Okay, I'm back. And fittingly, I have a copy of Debbie Bliss' Classic Knits for Kids! How that for a coincidence? If you want to win this baby, leave me a comment before Wednesday night at Midnight EST and I'll use the random number generator to chose the winner (you must be a US residence...pesky shipping rates). Sigh. Some people! I love the designs. Don't let it get to you. Congratulations on your publication! I learned when I started blogging that there is someone that will always find something wrong with whatever it is you say or do. I took it so personally at first, but you've got to just shake it off. Seriously, I'll have to tell you the Real Simple magazine story sometime or the one where I sold a loom via ravelry. People just troll the Internet looking to give people a hard time. Thanks for the great patterns!!!! I agree with you. The criticism is legitimate, but it hurts. The choice of tone used matters. I think people forget that. We can't be omniscient. Maybe we should all know not to put buttons on those mittens, but we forget sometimes when we design things. We get carried away by the design. And you couldn't possibly know that my special needs 2-3 year old was still putting everything in his mouth, so it would have to be my discretion to change the design for him. I get all the CSPC recall emails, and there are ALWAYS manufacturers who need to recall childrens' hoodies for drawstrings because they are a choking hazard. You would think the whole industry would have learned by now. I design a little, but teach a lot of beginners. And even in those classes, I will get troll like behavior. I have to learn to take a deep breath and try to ignore it, and not let it hurt my confidence. You are doing great things; just add the safety considerations to your design process. I've learned over the years that there are some people who always see the negative, and it makes me sad. However, I believe there are more of us who live their lives accentuating the positive. I'm sorry you got one of those sour grapes people, but please don't let it steal your joy. Being chosen for such a great publication and then being chosen for the preview is awesome! I'm looking forward to purchasing my copy of this magazine and can't wait to check out your patterns. You rock, Cambria!